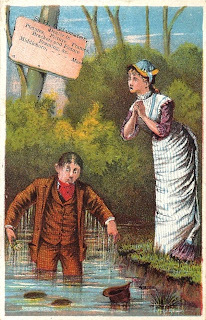 As is the case today, advertising over a hundred years ago relied upon humor to promote products and services. Solomon H. Sylvester, a Center Street dealer in photo albums and frames, jewelry, and other assorted merchandise, and grocer Ira Thomas on North Main Street employed the same set of advertising trade cards to distribute to their customers, both actual and potential. 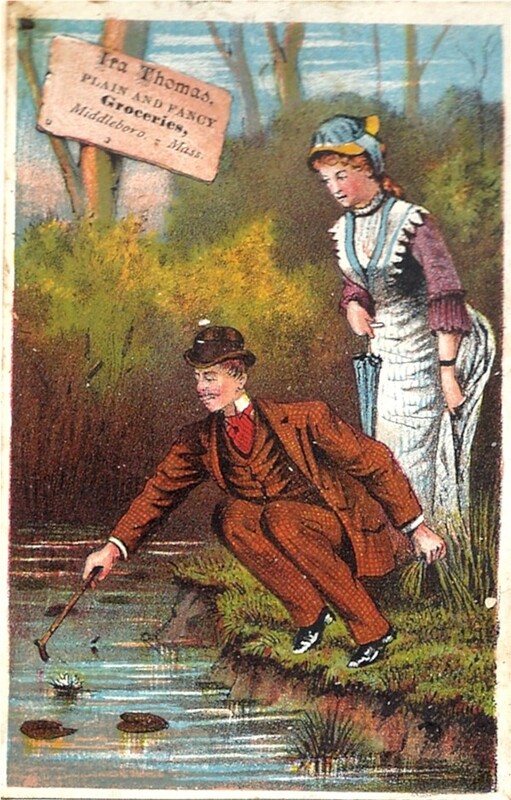 In this set, the hapless man attempts to secure a water lily for his lovely companion. Unfortunately, he plunges into the water below. Though he has retrieved the flower, he has lost his bowler (along with his dignity). Such advertising trade cards were popular in the last quarter of the 19th century as printing advances made color lithography popular and inexpensive. 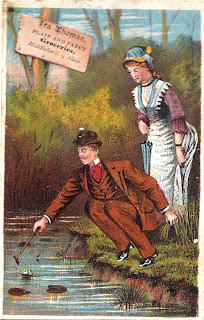 Sylvester particularly was noted in Middleborough for the wide variety of colorful trade cards he distributed, many of unique design.